Two summers ago, Henry Brown began experiencing unexplained pain in his right arm. His parents took him to see numerous doctors in his home state of New York and elsewhere, but Henry tells us "none were able to tell me what was wrong." The one thing doctors were able to tell Henry was that the pain, concentrated in his elbow, was reducing his range of motion. "We were told he might never play sports again," Henry's mom, Leslie Brown, tells us. "He's a great athlete and so there was a real emotional component to all of this for him as well." A family friend (who also happens to be a doctor) recommended that Leslie and Henry fly to Rochester, Minnesota, and meet with Mayo Clinic orthopedic surgeon and elbow specialist Shawn O'Driscoll, M.D., Ph.D. They did just that, and soon Henry had a diagnosis as well as a treatment plan. And though that diagnosis — avascular necrosis — initially was a little frightening, Henry tells us he was also relieved. "It was great to finally have a diagnosis, because we'd already spent two years seeing so many other doctors," he says. "I was really glad Dr. O'Driscoll knew what was wrong and that he was going to do something to fix it." That "something" would turn out to be corrective surgery to repair the small fracture in Henry's elbow that had broken apart and cut off the blood supply to that area. The surgery "went great," Henry tells us. A problem cropped up, however, during Henry's recovery. "I really couldn't lean over to one side because I was wearing this huge cast," he tells us. "So it was really uncomfortable to sleep." Then one day, inspiration struck Leslie. She made a trip to the gift shop at the Saint Marys campus of Mayo Clinic Hospital, returning to Henry's room with a stuffed teddy bear. "That bear was great to have because it helped me sleep better," Henry says. "I could lean on it and not be so uncomfortable." 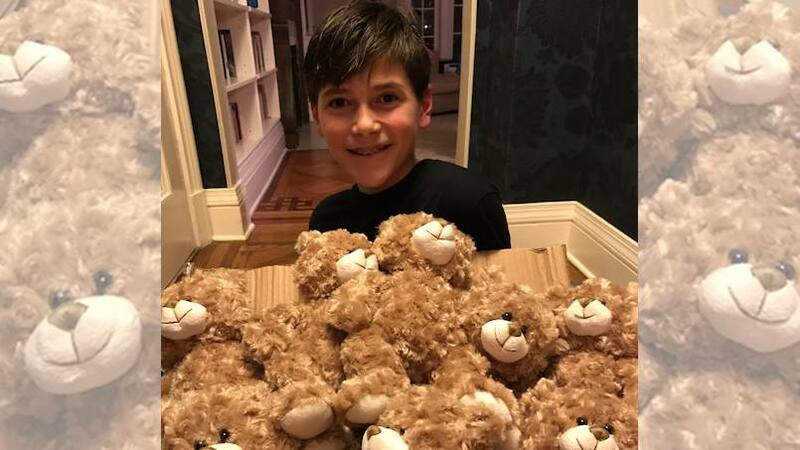 The bear became so important to Henry's recovery that he decided he wanted to do something to help other young patients feel that same kind of comfort and support. So when he got back home, the industrious 13-year-old started a car detailing business — called Hugs from Henry — with a caring and compassionate twist. "I use 20 percent of whatever money I make to buy teddy bears for other patients," Henry says. And we'd say he's off to a pretty good start. "I made $600 last summer, and with that we were able to buy 25 teddy bears for patients at Mayo Clinic," Henry tells us. It was the kind of special delivery Henry hopes to continue making when he opens his doors again, so to speak, this coming summer. "I'm definitely going to continue my summer business and continue with the donations — that means a lot to me," he says. "And I feel great right now. No pain at all, and my range of motion is back. I'm also playing sports again now that Dr. O'Driscoll has cleared me to do so." Consider yourself fully cleared to share your comments below. You can use the handy social media tools atop this page to share this story with others.